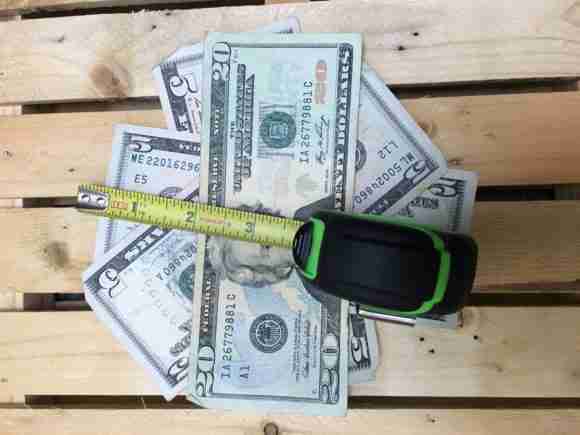 You are here: Home / Featured Articles / Wood Pallets: Are You Getting What You Paid For? There are undoubtedly hundreds of purchasers that get the pallet spend tossed in their lap but never receive the resources and support needed to manage it in a professional, informed manner. Often a proper specification doesn’t exist, making it impossible to communicate what is necessary from the vendors. Additionally, purchasers seldom possess the lumber knowledge required to determine if they are getting what they requested, even when they have a specification to reference. Without this fundamental understanding to assess pallets you are largely at the mercy of pallet salespeople. Buddy, this is not a good place to be as we have all kinds in our industry. We have folks so honest and helpful you’ll feel like you’re being held by your mama while sipping hot cocoa beside the fireplace. 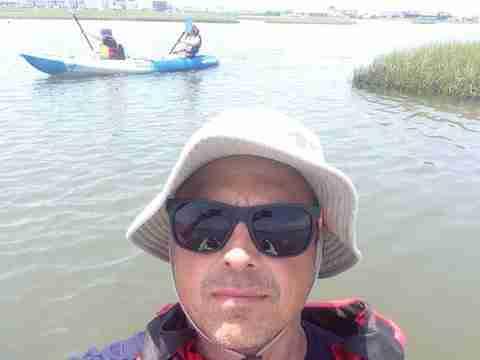 We also have folks that will make you feel like you were rubbed down with a raw pork chop before being tricked to go hiking deep into bear country. The scary part is you often can’t tell which is which until you’ve run out of cocoa …or feel bear breath on your neck. The single greatest defense is understanding how to properly measure pallets and evaluate the findings. And, no, it’s not as simple as measuring two boards and walking away…that’s exactly what the bear wants you to think so you won’t find the protective embrace of mama. Here is the first thing you need to understand so that you can fend off the shady salespeople, and make connections with the good ones. No pallet maker, even the best guys in the country, can produce truckloads of pallets, over and over, where every component is exactly the size it is supposed to be. Wood is a natural material, with natural irregularities. As a result, it is impossible for the pallet industry to process it in such an exacting manner. For this reason, you can’t just measure a few deck boards or a couple of stringers and hand down a legitimate judgment. The shady folks want you to think two measurements are fine. They know they can spot a couple proper cuts within that load of crap they sent and measure them in front of you. They also know they can spot a couple thin cuts from the good folks, measure them in front of you, and make the good guys look like cheaters. Then, the good guys (I know, it sounds like an old Western) look visibly agitated and want you to measure a hundred boards. Now they look like desperate pallet psychotics. Then, the bad guys win and you lose. So, let’s go measure at least 50 deck boards. 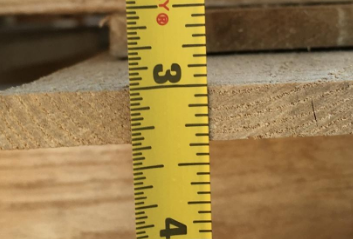 Let’s not measure any two deck boards on the same pallet, though. In fact, let’s only measure two deck boards from the same stack! Also, don’t use the shiny tip of your tape measure for this. They can become bent and we want to be able to measure with accuracy to the closest 1/16” of an inch. Let’s employ a technique like this. POW! The perfect ½” board. Here is an example of a legitimate ½” board that is 1/32” undersized. This one is just shy of 3/8”. Now the interesting part for me, perhaps scary for you, is that all of these were sold as a ½” pallet. They could very easily have been from the same vendor in the same load. Each of these measurements, on its own, means very little because the milling of industrial wood is not an exacting process. That’s why I want you to measure 50 or more of a component spread out across the whole load. It’s only when we analyze all those measurements together that you begin to understand what is happening. 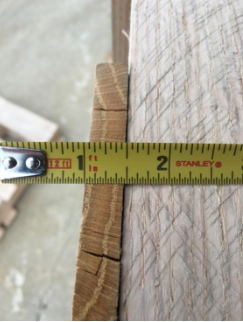 (70% 1/2” – 10% 9/16” – 15% 7/16”) – This is a solid situation where the vendor is definitely aiming for an honest ½”. They probably use a band saw. The blade can walk little which is why you are getting the non-1/2” boards. 70% on the mark while the variations are small is a good result. (60% 7/16” – 25% 1/2” – 15% 3/8”) – This is a situation where you are being told ½” and being sold 7/16”. The shady guys will pick out a couple full dimension boards and measure them in front of you (a good eye can see the 25% that are good). Don’t fall for it. 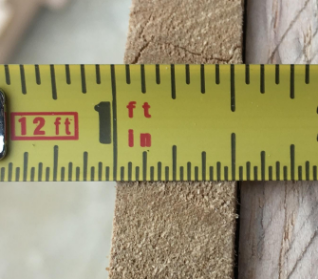 When you are buying ½”, a board that only measures 3/8” should be an anomaly. (80% 15/32” – 10% ½” – 10% 7/16%) – This is a situation where there is an honest attempt to produce ½” decking from a feedstock that is just a bit short on real estate. In this situation the manufacturer is probably cutting from cants on a double arbor gang saw. Because the blades are solid (the circle blades you know and love) there is less variation than in the examples above. They have to set the spacers on the blades just a hair short of true ½” (downside) but can generally control that size very well (upside). I’ll accept this scenario without regret every time. There are two ideas you need to take away. You have to measure a lot of components and look at them all as a body of work. Also, if the majority of the measurements are 1/16″ shy of what you were told you would get, then you’re not getting what you were told. Feel free to contact me with your measurements and I’d be happy to help you decode them! The opinions stated above are those of the contributor and do not necessarily reflect the views of PackagingRevolution.net. To speak to Tyson and find out more about the innovative wood pallet solutions offered by The Pallet Alliance, Inc., visit www.tpai.com or contact Tyson at tysteffens1@gmail.com.